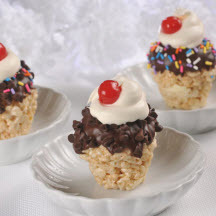 These adorable, fun treats are easy to make and makes a delightfully cute dessert for any occasion. Spray a large bowl with nonstick cooking spray. Heat, marshmallows and butter in large, heavy-duty 6-quart saucepan over medium-low heat, stirring frequently, for 5 to 10 minutes, until smooth. Remove from heat. Working quickly, stir in cereal. Carefully transfer mixture to prepared bowl. Cool for 5 minutes. Line baking sheet with wax paper. Spray 24 mini muffin cups and hands with nonstick cooking spray. Press about 1/3 cup marshmallow mixture into prepared muffin cups, shaping mixture above cups into rounded “ice cream scoop” shapes with ice cream scoop or two tablespoons. Microwave 1 1/4 cups morsels and vegetable shortening in dry, uncovered, microwave-safe bowl on HIGH power for 45 seconds; STIR. The morsels may retain some of their original shape. If necessary, microwave at additional 10 to 15-second intervals, stirring just until morsels are melted. Dip tops of sundaes in chocolate. Immediately decorate with sprinkles and remaining 1/4 cup morsels. Let stand until chocolate is firm. Store in airtight containers. Before serving, top each “sundae” with 1 tablespoon whipped topping and a cherry. Nutritional Information Per Serving (1/24 of recipe): Calories 170; Calories from Fat 60; Total Fat 7g; Saturated Fat 4g; Cholesterol 5mg; Sodium 100mg; Carbohydrates 29g; Dietary Fiber 1g; Sugars 17g; Protein 1g.